We have the opportunity to help with many medical situations, particularly cataract surgery. Adult cataract surgery is very inexpensive, and is often done in an assembly-line process, even in rural settings, sometimes with hundreds of surgeries over several days. Pediatric surgery is more expensive, largely because of the need for full anesthesia in a hospital setting (because children are less compliant than adults). But timely cataract surgery for children is critically important -- not only because children have so many years of potential ahead of them -- but because after several years without sight, the brain switches visual ability off, and repair is no longer possible. Here are a few of the many patients that currently need funding. Funds will be directed toward those deemed most urgent by local workers, based on a variety of factors such as medical urgency, logistics, or the geographic availability of care -- not necessarily in the order shown here. Our local staff will update the list periodically. Kyle was born with a bilateral congenital cataract. He is staying with his grandparents as his parents have been separated since he was one year old. His father's meager income could hardly support his scholastic and medical needs. For this reason, his teachers and parents asked the assistance of Resources for the Blind, Inc.
12/20/2018 Kyle was accepted into the pediatric surgery program. Michelle Anzano is the eldest of two siblings. Her eye problem surfaced a month after she was born. Worried about her situation, her parents sought the help of their community health workers. Having learned that her problem is a case of congenital cataract, her parents were saddened and clueless on how they can provide for her medical needs given their little income. One day, they were referred to a special education teacher who also referred them to RBI. 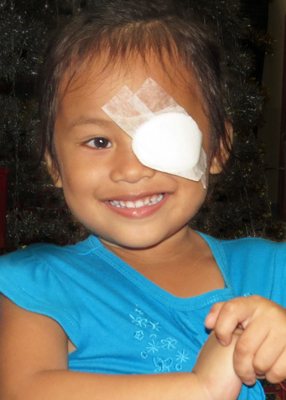 At present, they are hopeful that through RBI Michelle will soon be operated and get her vision improved. 12/20/2018 Michelle was accepted to the pediatric surgery program.